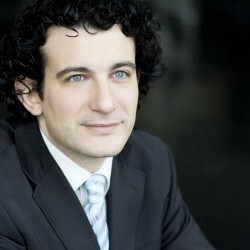 In his third season as Music Director of Brussels’s Théâtre Royal de la Monnaie, Alain Altinoglu continues to earn rave reviews for his intense yet refined performances. Productions that Altinoglu conducts in the 2018/19 include Donizetti’s Don Pasquale, Rimsky-Korsakov’s Tsar Saltan as well as Wagner’s Tristan and Isolde. Furthermore, the Orchestre symphonique de la Monnaie and Alain Altinoglu will embark on a Beethoven cycle throughout the season, juxtaposing all nine symphonies with world premieres of new works, specifically commissioned by La Monnaie for this occasion. Alain Altinoglu regularly conducts such distinguished orchestras as the Boston Symphony, Chicago Symphony, The Philadelphia Orchestra, City of Birmingham Symphony Orchestra, London Symphony Orchestra, Philharmonia Orchestra London, Danish National Symphony Orchestra, Royal Stockholm Philharmonic Orchestra, Sächsische Staatskapelle Dresden, Berliner Philharmoniker, Staatskapelle Berlin, Rundfunk-Sinfonieorchester Berlin, Deutsches Symphonie-Orchester Berlin, Symphonieorchester des Bayerischen Rundfunks, Wiener Philharmoniker, the Tonhalle-Orchester Zürich as well as all the major Parisian orchestras. Highlights of his 2018/19 season include Altinoglu’s debut at the BBC Proms with the Royal Philharmonic Orchestra. He conducts the Wiener Philharmoniker at the prestigious Musikverein, gives debuts with the Swedish Radio Symphony Orchestra, WDR Sinfonieorchester Köln as well as Orchestre Symphonique de Montréal and returns to the Cleveland Orchestra, Rundfunk-Sinfonieorchester Berlin, Wiener Symphoniker as well as on tour throughout Europe with the Russian National Orchestra as well as Orchestre National de France. In opera, Altinoglu takes on a new David McVicar production of Berlioz’s monumental opera Les Troyens at the Wiener Staatsoper. A regular guest at the world’s leading opera houses, Altinoglu appears at Metropolitan Opera New York, Royal Opera House London Covent Garden, the Teatro Colón Buenos Aires, Wiener Staatsoper, Opernhaus Zürich, Deutsche Oper Berlin, Staatsoper Unter den Linden, the Bayerische Staatsoper München and all three opera houses in Paris. He has also appeared at the festivals in Bayreuth, Salzburg, Orange and Aix-en-Provence. Alongside his conducting, Altinoglu maintains a strong affinity and command over the Lied repertoire. Regularly accompanying mezzo-soprano Nora Gubisch, their most recent recording for Naïve includes folk songs by de Falla, Obradors, Granados, Berio and Brahms. Other recordings together have included a disc of songs by Henri Duparc (Cascavelle) and Maurice Ravel (Naïve). Altinoglu recorded arias with Piotr Beczala for Deutsche Grammophon. Past releases include Lalo’s Fiesque with the Orchestre National de Montpellier and Roberto Alagna (DG) and Liszt’s Piano Concertos with the Rundfunk-Sinfonieorchester Berlin (PentaTone). DVD recordings include Honegger’s Jeanne d’Arc au bûcher (Accord) in 2007 and a recording of Wagner’s Der fliegende Ho lländer (DG) in 2015. Born in Paris, Alain Altinoglu studied at the Conservatoire National Supérieur de Musique de Paris where he now teaches the conducting class.